Yesterday we did some painting as part of NurtureStore's #simpleplay project. Instead of using paper, we decided to paint right on the ice. This activity is super easy and a little bit addictive. To start you just paint your heart out onto the ice. Once the ice is covered in paint... rinse off the top of the ice quickly in the sink with cold water. Then rinse again... and paint again... and on and on until the ice is melted completely. It takes a little while to melt and is a great simple science activity for kids related to liquids, solids, and melting! My son made so many excellent science observations while we painted and the ice slowly turned from a solid back into a liquid. We also loved talking about colors and mixing them to make new ones. 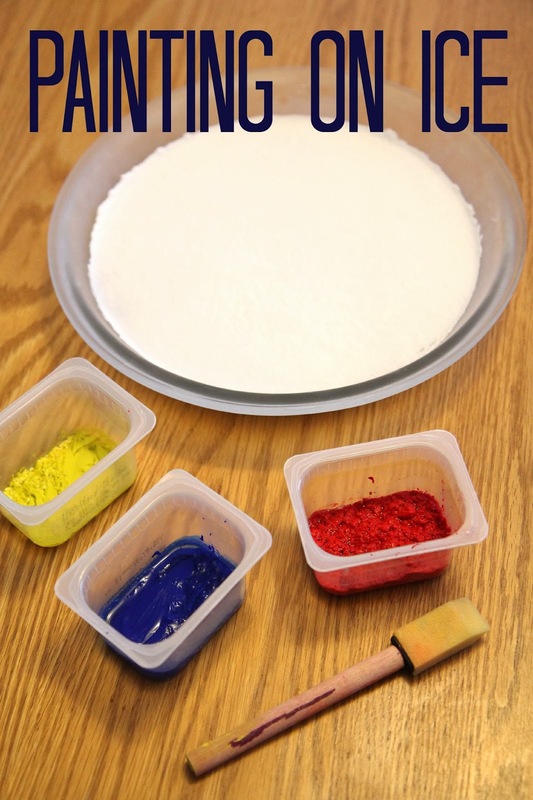 Mouse Paint by Ellen Stoll Walsh is a fun book to read along with this activity. I have a feeling this is going to be a new favorite "go to" activity . Do you have any favorite activities with ice? Make sure to enter our blog birthday giveaway if you haven't yet and join our celebration!! Toddler Approved just had it's fourth birthday and we're sharing four of our favorite things... including a $25 Target gift card! What kind of paint did you use? Thanks! I'm just using washable Crayola finger paints. How much water per 1/2 cup of baking soda? Thanks! Probably about 2 cups of water... maybe 3? Whatever filled up our pie pan. We recently used liquid watercolors to paint snow inside, and it was a huge hit, so this would be a great follow up project. Thanks for the cool idea! Love this idea! Could I suggest having a "printer friendly" button on the screen for each activity that would eliminate the pictures and have only the directions? I am putting together a Toddler "Science" Folder for my kids (2, 1 & 2 weeks old). It would be awesome to have the directions for your activities in a simple to read format after looking at them online. Is there a 'printer friendly' button for the directions? I'm putting together a Toddler "science" Folder for my kiddos who are 2, 1 & 3 weeks old. I used to do this as a teacher and it made things really easy later on when I wanted to redo an activity. :) If I could print out the activities in simple form (listed directions/items, without pictures) after looking at them online, it would be really helpful! Thanks for the great ideas! Hi HBBlogger, thanks for the suggestion. I'll have to consider doing that. Our house is mostly paperless, so haven't thought about it but will definitely look into it. Thanks! Just found your page! Love this idea as I work in a nursery and am always looking for new inspiration s to keep the children entertained! Brilliant thanks for sharing this! do you use hot water to melt the baking soda. i had trouble getting it not to settle on bottom of containers when i mixed it. any advice would be greatly appreciated!